TAMPA, Fla. (AP) Cam Newton is fine with where the Carolina Panthers are halfway through the season. ”At the end of the day, it’s a lot of teams that wish they were 5-3,” the quarterback said after Sunday’s 17-3 victory over the Tampa Bay Buccaneers stopped a two-game losing streak that knocked the team out of first place in the NFC South. Coach Ron Rivera echoes that sentiment, noting there plenty of room for improvement. Newton talks of holding himself to a higher standard offensively. Defensively, the Panthers are on the way re-establishing themselves among the NFL’s elite after not allowing opponents to score offensive touchdowns in consecutive games. Tampa Bay (2-5) is answering questions about what it needs to do to get its season turned around after failing to score a TD in a game for the first time since Jameis Winston entered the league as the No. 1 overall pick in the 2015 draft. The Panthers forced three turnovers by the young quarterback and also sacked him three times. The Bucs have lost four straight, with Winston playing the past two games with an injured throwing shoulder. A defense expected to be a strength al(so seems to be regressing. Winston rejects the notion there’s little margin for error moving forward if the Bucs are going to turn their season around. WINSTON’S SHOULDER: Tampa Bay’s third-year quarterback said the sprained AC joint in his right shoulder wasn’t a factor in his performance. Winston was 21 of 38 for 210 yards passing. He was intercepted twice and a lost a fumble. ”Three turnovers by me, you can’t win like that,” he said. EFFICIENT, NOT FLASHY: Newton was 18 of 32 passing for 154 yards, one touchdown and an interception. He also led the Panthers with 44 yards rushing on 11 carries. HE’S BACK: Carolina LB Luke Kuechly returned after missing one game because on a concussion. 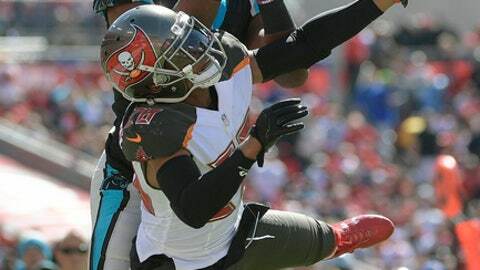 He had eight tackles, including one for a loss, and had an interception in the fourth quarter, when the Panthers had two picks and stopped the Bucs another time on downs. WHAT A RUSHER: Panthers DE Julius Peppers moved ahead of Hall of Famer Chris Doleman into fourth place on the career sack list with 151, taking down Winston and forcing a fumble in the second quarter. The 16-year veteran has 7 1/2 this season. Tampa Bay, which didn’t have any Sunday, has seven as a team – last in the league. ”Right now, I’m more excited about us getting a road win because this was really important for the team,” said Peppers, who was named a captain for the game and was also presented with a game ball in recognition of the milestone.